This program of music is dedicated to my wife, Janice Notland. 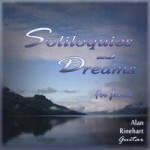 The title work, Soliloquies and Dreams, was written for and dedicated to Alan Rinehart by Vancouver composer David Gordon Duke in 2003. It’s seven short movements explore the many colour and articulation possibilities available to the guitarist, evoking a subtly personal atmosphere. Paganini’s Romanze is the middle movement of the Grand Sonata, Op.35. Originally intended to be a ‘Sonata for guitar with violin accompaniment’, it has become a staple of the solo guitar repertoire. The strong association of Flamenco music with Spanish culture overshadows the rich repertoire of very romantic but still distinctly Hispanic music that flourished in the late 1800’s. Isaac Albeniz and Enrique Granados were the most famous exponents of this nationalistic style but there were many others, guitarists included. The music of Spanish guitarist-composers enjoyed great popular acclaim at the end of the nineteenth Century. By mixing folkloric elements from the native Flamenco tradition with the classical forms, they created a synthesis of style and playing technique that has persisted in the concert music of the guitar for the last hundred years. Francisco Tarrega was undoubtedly the most influential of these. His Prelude is subtitled ‘A Vision from the Devil’s Tower’. Jose Broca was a well-known guitarist at the time whose popularity waned as musical fashion changed. Pensamiento Español is a wonderful example of his delicate and appealing style. Another of Tarrega’s contributions to the concert repertoire was the arrangement of the music of his contemporaries. His transcription of Joaquin Malats’ Serenata Española was dedicated to Tarrega’s friend Dr. Walter Leckie. Paraguayan Agustin Barrios (1885-1944) was a guitar master of the highest order. He was the first guitarist to make a commercial recording and he was an active and acclaimed performer throughout South and Central America. A resurgence in interest in his compositions began in the mid 1970’s and many of his works are now fixtures in the repertoire. Julia Florida is a Barcarole (a Venetian boat song) dedicated to his niece, while Caazaapa is built on Paraguayan folk music. Oración is an expressive “song without words”. Manuel Maria Ponce is one of Mexico’s most important musical figures. His close association with Andres Segovia resulted in many major works for the guitar. He composed a suite of four dances, which besides the Waltz, included the lesser known Trópico, Rumba and a Mazurka. The Mazurka has been replaced on this recording with his arrangement of the popular Mexican song Por Ti, Mi Corazón (“for you, my heart”). Reginald Smith-Brindle was a respected British scholar and composer who wrote a textbook on serial composition. He was a great lover of the guitar, contributing several often-played pieces to the repertoire. Do Not Go Gentle, written in 1974, is a musical reflection on a poem by Dylan Thomas. The Haitian guitarist Franz Casseus had a well-established career as a performer and music editor in New York in the mid-20th century. His music captures the rhythmic and melodic vitality of his native Haiti and his knowledge of the guitar idiom is evident in all of the movements. The original published Haitian Suite had a movement, Mascarón, which I have taken the performer’s liberty of replacing with a stand-alone piece, the Serenade Lointaine. Coumbite enjoyed a second life as one of Harry Belafonte’s best known songs. David Gordon Duke was born in Vancouver, studied historical musicology and has worked as a college teacher and administrator. For the last decade he has also reviewed classical music for The Vancouver Sun. He has written many educational works, as well as a smaller body of concert works for voice(s), piano, chamber ensembles and orchestra. Argentina’s Maximo Diego Pujol is himself an excellent guitarist. Greatly influenced by the music of the tango, his compositions further the tradition of Astor Piazzola. A melodic gift and understanding of the idiom is clearly evident in his work. His Cinco Preludios are featured on my recording Musical Banquet. 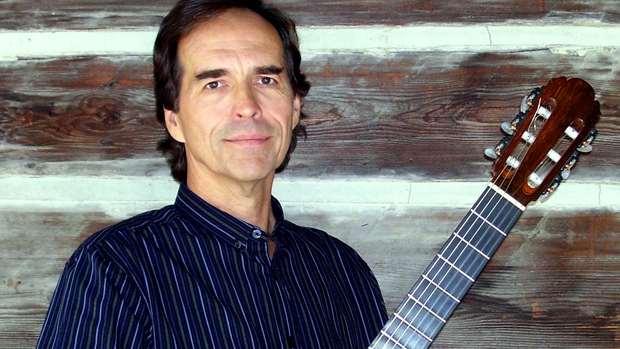 He composed a fine work for the Vancouver Guitar Quartet, Cinco Piezas Artisanales that the VGQ premiered and recorded for the CBC. Pagina de Radio and Verde Alma are from a set of four solo pieces written in 2003. Stanley Myers wrote Cavatina in 1970 originally for the piano and it enjoyed modest success for a number of years. It took John Williams’ clever arrangement for guitar in the Academy Award winning movie The Deer Hunter to bring the nostalgic piece to world-wide attention. Used in other productions, it is known as the song He Was Beautiful. Milonga by Jorge Cardoso is one of the most often-performed and recorded South American guitar pieces, and for good reason, since it is a beautifully-crafted example of one of the components of modern Argentine Tango. This music on Soliloquies and Dreams was chosen to celebrate the ability of the guitar to evoke an intimate and personal atmosphere for the listener. The program of music was selected with the help of my wife to whom I give the greatest acknowledgement for her inspiration, encouragement and patience. I would also like to give special thanks to Sean Davies for his sound processing skills, Clive Titmuss for his help with the program notes and to Fritz Mueller for the constructionof his wonderful double-top guitar that is featured on tracks 2 and 5.